Steve Roberts, of ” Columbus, Ohio is a really “laid-back” person. 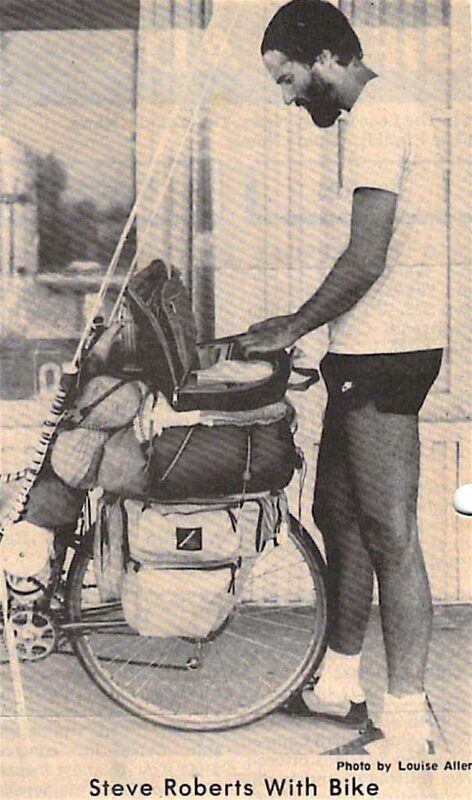 Even the bicycle he rides on his round the States tour is totally laid-back, and he rides it in a reclining position with feet forward, steering with handlebars under his seat. He, and his custom-made bicycle, attracted a great deal of attention as he stopped briefly in Apalachicola, Sunday, March 25, to visit the Gorrie Museum. Roberts happily explained all the features on his custom made bike, which he designed himself, and had custom made in a shop in Ohio. His bike is equipped with a solar collector to power the lights, horn, security system, CB, and a small word processor. Roberts uses the word processor in his career as a freelance writer. He does a lot of his articles for the computer magazines, and said he has written three books. His future plans are to travel to New Mexico and somewhere along the way he will be interviewed by Real People who will do a feature on him and his unusual conveyance. When he arrives in New Mexico he will allow the weather to decide whether he will keep on towards California or strike north towards Canada. He plans to spend two full years all around the United States and then he hopes to strike off to Europe. He travelled the entire Eastern coastline of Florida, and went all the way to Key West. From Key West to Clearwater he was invited aboard a 36 foot racing yacht. He said that he finds the people of the United States to be friendly. His machine almost always is a conversation piece no matter where he goes. For instance, on Friday, March 23, he was just east of Carrabelle when he saw a lady who appeared to be in need of assistance as she stood by her broken down car. He offered his help, and in return he found new friends and a bed for the night with them in Lanark Village. 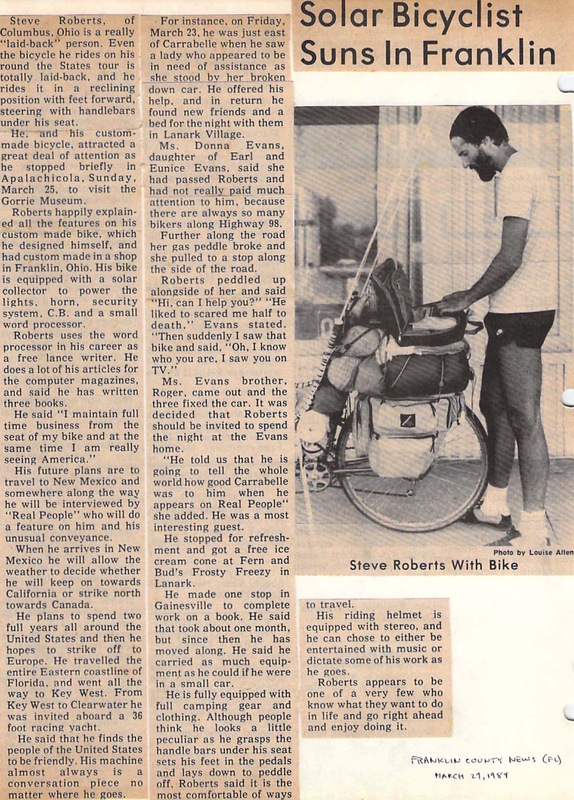 Ms. Donna Evans, daughter of Earl and Eunice Evans, said she had passed Roberts and had not really paid much attention to him, because there are always so many bikers along Highway 98. Further along the road her gas pedal broke and she pulled to a stop along the side of the road. Ms. Evans brother, Roger, came out and the three fixed the car. It was decided that Roberts should be invited to spend the night at the Evans home. “He told us that he is going to tell the whole world how good Carrabelle was to him when he appears on Real People” she added. He was a most interesting guest. He stopped for refreshment and got a free ice cream cone at Fern and Bud’s Frosty Freezy in Lanark. He made one stop in Gainesville to complete work on a book. He said that took about one month, but since then he has moved along. He said he carried as much equipment as he could if he were in a small car. He is fully equipped with full camping gear and clothing. Although people think he looks a little peculiar as he grasps the handlebars under his seat sets his feet in the pedals and lays down to peddle off, Roberts said it is the most comfortable of ways to travel. His riding helmet is equipped with stereo, and he can chose to either be entertained with music or dictate some of his work as he goes. Roberts appears to be one of a very few who know what they want to do in life and go right ahead and enjoy doing it.